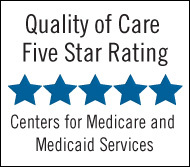 Zumbrota Health Services (ZHS), a long term care facility in Zumbrota, MN was recently ranked 26th out of 358 nursing homes in the State with regards to Resident Satisfaction and Quality of Life. The survey is based on face to face interviews of residents in each nursing facility in the state by trained interviewers from Vital Research, a research firm in collaboration with the Minnesota Department of Health. Standardized questions are used to interview a sample of residents in each facility in regard to issues important to their quality of life. There are eight domains in the satisfaction survey; Meaningful activities, food enjoyment, environment, dignity, autonomy, relationships, caregiving, and mood. ZHS also scored as the 5th best nursing home in the state for staff/resident relationships. To learn more about the survey and results visit http://nhreportcard.dhs.mn.gov. Zumbrota Health Services has made the commitment to use antibiotics responsibly by putting an Antibiotic Stewardship Program in place. Zumbrota Health Services has been actively working to establish a culture that embraces the proper use of antibiotics in the treatment of infections. By doing so, Zumbrota Health Services hopes to reduce the adverse effects associated with antibiotic use and to minimize the risk of antibiotic resistance (the development of bacteria that are resistant to antibiotic medication). Antibiotic-resistant bacteria are harder to kill and can cause harmful complications and untreatable infections. Using antibiotic medication only when truly needed preserves the power of antibiotics and allows for better outcomes. Zumbrota Health Services has put evidenced based practice guidelines in place and has provided education to staff on their Antibiotic Stewardship Program and Infection Prevention and Control Program. Educational resources and materials have been developed for residents and families too. 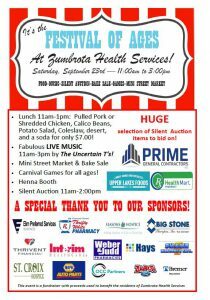 Zumbrota Health Services will continue to work with their medical providers, pharmacy consultants, and entire healthcare team to expand the program and aim for excellence in care. SAINT PAUL – 12/1/17– Zumbrota Health Services received $20,000 from the LeadingAge Minnesota Foundation to address the growing challenge of workforce recruitment and retention in aging services. “Workforce development continues to be the number one concern of aging services providers. These grants will spark new ways to recruit new people to the profession as well as to keep experienced staff committed to the field,” said Gayle Kvenvold, President and CEO, LeadingAge Minnesota. Zumbrota Health services will use the $20,000 workforce solutions grant to improve employee stress and burnout by creating an Employee-only Wellness Suite and Wellness Coaching. This Wellness Suite includes treadmills, elliptical, free weights, workout equipment, massage chairs, and aromatherapy. Wellness coaches will provide personalized wellness plans for staff as well as customized smoking cessation programs. The purpose of this program is to give employees a way to combat stress and burnout – both work related and home – in a free, healthy manner, while creating a lower stress work environment and greater employee satisfaction. The shortage of workers has a direct impact on older Minnesotans being able to get the care that they need in some communities. In 2016, more than 5,000 Minnesota care center admissions were denied due to lack of staff. By 2024, it is estimated that there will be more than 16,000 job openings for nursing assistants, home health aides, and other staff that serve seniors across the state. “The grant awarded to Zumbrota Health Services will benefit the aging services field, as providers across the state will be able to share in the best practices that this grant will demonstrate,” Kvenvold said. LeadingAge Minnesota Foundation received requested for more than $2.6 million in funding requests, which demonstrates the large need for solutions to address the caregiving crisis across the state. Examples of awarded projects include intercultural work coaches, literacy improvement tools for staff with English as a Second Language, and a career awareness toolkit addressing misconceptions about aging services jobs. Very proud to be recognized as the top 99 Nursing Homes in Minnesota! Look who maDe the list!!! Zumbrota Health Services has an annual survey every year conducted by the Department of Health to ensure that it is in compliance with all State and Federal Regulations governing nursing homes in Minnesota. 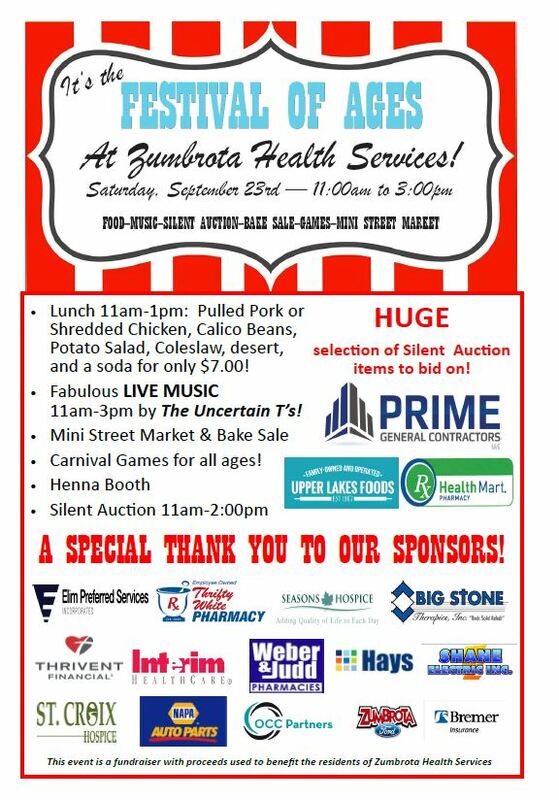 Zumbrota Health Services had its survey September 21st, 2017. ZHS is very proud to report that it had no deficiencies cited. This is very difficult to achieve and its the first time ZHS has successfully done so. We are proud of our team and the incredibly dedicated work they do to ensure that the residents of Zumbrota Health Services are safe and happy. We truly are one big family. 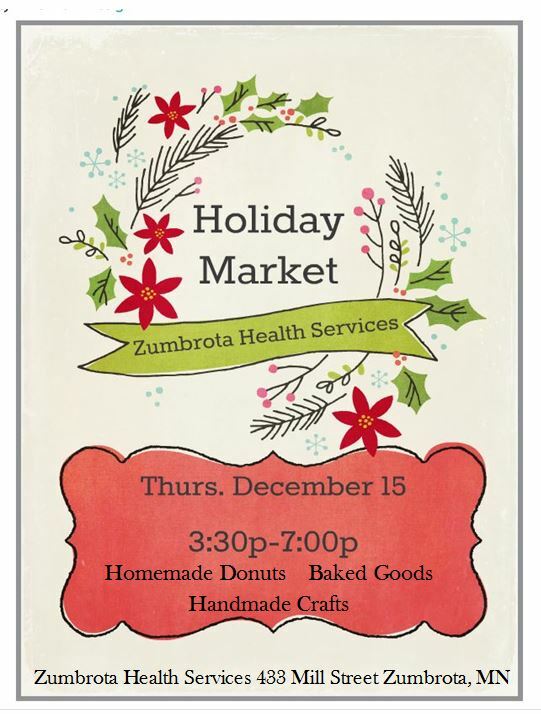 Zumbrota Health Services (ZHS) recognizes outstanding employees who have made a significant contribution within the facility each quarter. It also offers an opportunity for all employees to recognize their peers for their exceptional job performance. 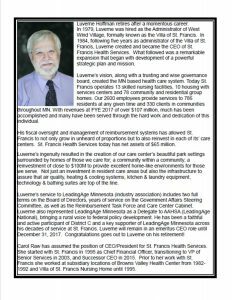 There are nine different criteria that a candidate must meet in order to be nominated; a positive attitude, provides service that reflects St. Francis Health Services’ Core Values, and carries out additional responsibilities beyond their regular job assignment. Angela Walker, Bath Aide/NAR at Zumbrota Health Services, was awarded Employee of the 2nd Quarter – 2017! 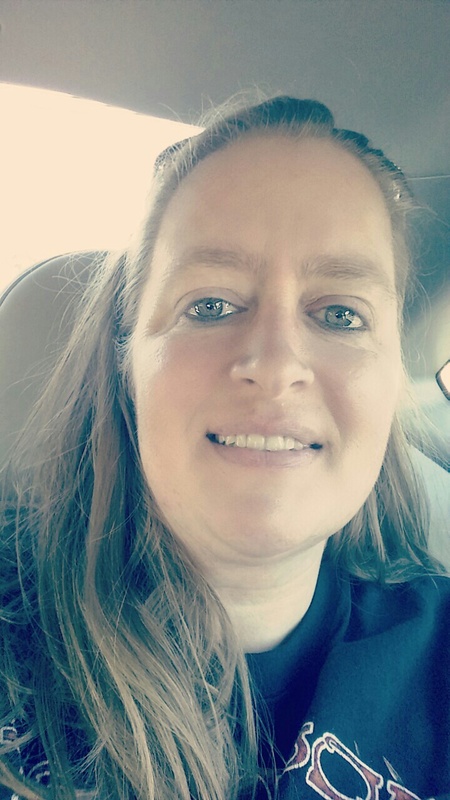 Angela joined the ZHS family this past April as a Bath Aide/NAR and has joyfully embraced the service ethic set forth by St. Francis Health Services with her positive attitude and empathetic nature. She is above all a caring health care professional that goes out of her way to bring joy to the residents of ZHS! Angie is the youngest of three, and considers her parents Heroes as they always worked hard to give them a good life and always made them feel loved and cared for. Her mother used to work at ZHS, enabling Angie and her sister opportunities to visit with the residents. Angie knew then that her passion was helping the elderly. Her career started at the age of 12 when she began babysitting and at age 14 became a Candy Striper at the Zumbrota Hospital. Two years later she became a NAR and continues to love it 25 years later! She states she has learned so much over the years and still enjoys learning new things. She is an animal lover, especially dogs (she owns three!) and horses. Angie has an 18 year old daughter, Victoria, step-daughter, Danielle and a step-granddaughter, Lauryn whom she adores spending time with. She also enjoys visiting time with her niece and great nephew. Her hobbies include 4-Wheeling with her sister and good friends, and most recently has begun to travel. Her goal is to visit every state in the United States! She looks forward to being with friends and family and spending quiet time reading and sitting near a river relaxing. As the Employee of the Quarter, Angie was presented with a certificate of recognition as well as being recognized in ZHS’ publications, a 10-meal punch card from the facility, an Employee of the Quarter shirt, parks in an honorary parking spot during her reign, and is entered into the Employee of the Year drawing that will be held during the Annual Recognition event in February, 2018. The winner of the Employee of the Year will be presented with a weekend get-away at the Fitgers Hotel in Duluth, MN! Congratulations, Angie! 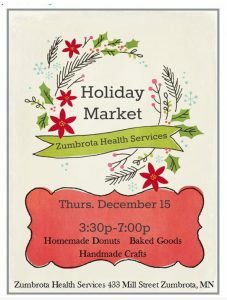 We are honored that you are a part of our Zumbrota Health Services family! Best of luck on your retirement! 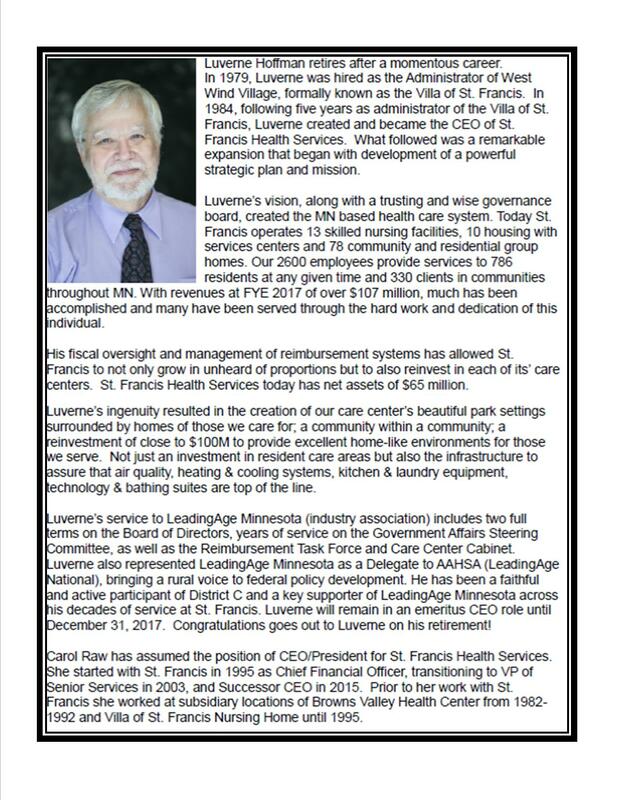 Thanks for all you did for Zumbrota Health Services and St. Francis Health Services! Fundraiser to raise money for the Activity Department for entertainment and social activities!